The Bridgestone Bandag Highway Guardian award honours the great community service of professional truck drivers in performing heroic and selfless acts while carrying out their normal role. Every one of their stories contributes to bridging the perceived gap between the trucking industry and the broader community. By bringing to light these incidents, the award will contribute to road safety awareness. 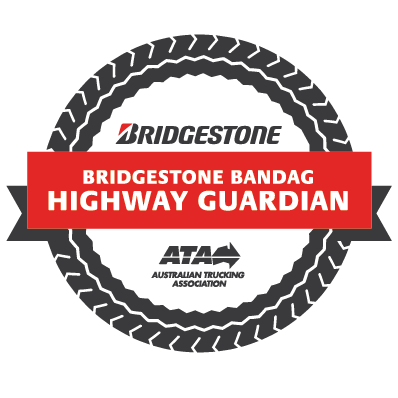 A Bridgestone Bandag Highway Guardian candidate might be brought to the ATA’s attention and acknowledged at any time during the year. This title is not exclusive to one person, but rather will belong to a growing number of drivers over time, if and when incidents occur. No incident is held up against or compared to another. The status of any Highway Guardian will be revered by their peers for all time. Each recipient of the honour will be hosted to the next ATA national event, Trucking Australia, including flights, delegate registration and accommodation. New Highway Guardians will be honoured by the peers at the ATA Foundation Sponsors Gala Dinner. Highway Guardians will also receive a jacket patch, truck sticker, lapel pin and trophy. There is no formal nomination process for a Highway Guardian. However, members of the public are encouraged to bring potential Highway Guardian candidates to the ATA’s attention by emailing us via our Contact Form at any time of the year.